February 22, 2017, ©. Leeham Co: Ryanair is Europe’s airline with the lowest fares. And it’s the most profitable, despite growing faster than even the Middle East carriers (growth needs money). It’s time to dive deep in this locomotive. I even flew their business class before writing the report, to understand what is going on. Ryanair was formed 1984 by Tony Ryan (founder of Guinness Peat Aviation leasing company) and partners, flying an Embraer Bandairante 15-seater between Ireland’s Waterford Airport (South of Dublin) and London Gatwick, giving Aer Lingus and British Airways some competition. Today, Ryanair is larger in transported passengers than Aer Lingus and British Airways combined. Ryanair is about to pass the world’s fourth airline, China Southern, in transported passengers (Figure 1). Figure 1.World’s largest airlines by passengers carried. Source: Wikipedia. The company plans to continue the growth (Figure 2). It plans to grow past American Airlines’ present size (in passengers carried) by 2020. Figure 2. 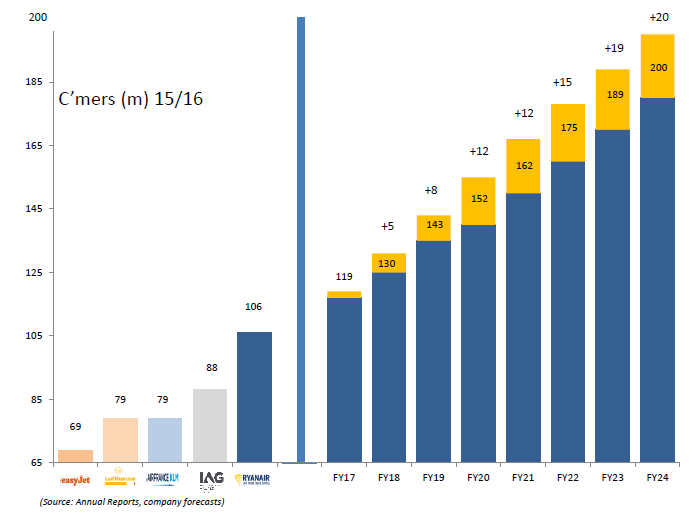 Ryanair’s end of 2016 size compared with other airlines and its future growth. Source: Ryanair. 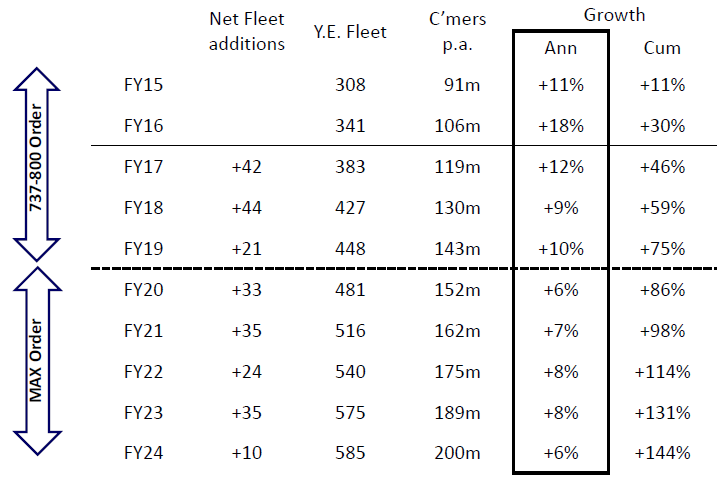 Figure 3 shows the fleet growth that goes with these plans. Ryanair goes from a fleet of 340 aircraft to just shy of 500. Figure 3. Ryanair’s future fleet additions to support the growth. Source: Ryanair. Ryanair’s market is Europe and it plans to continue its expansion in Europe, Figure 4. I talked with the company’s CFO, Neil Sorahan, last month in Dublin. He said that Ryanair had no plans to expand into long-haul. Instead, they are working with Norwegian to make Ryanair’s network feed Norwegian’s long-haul network. Figure 4. 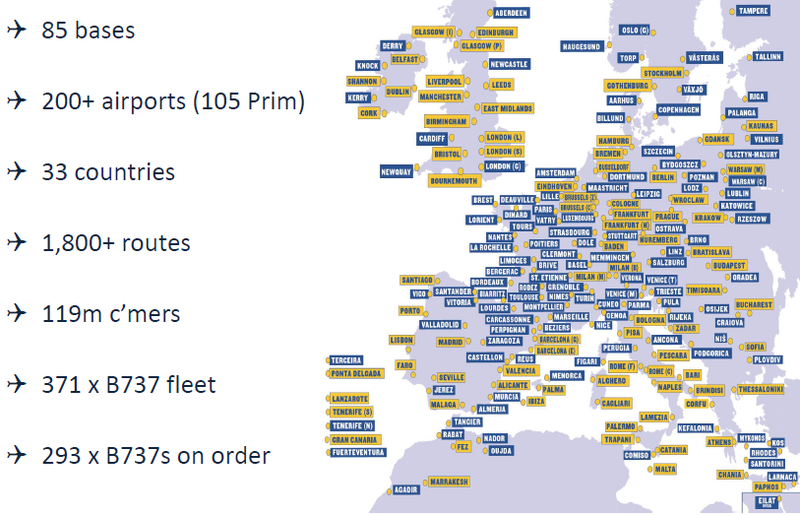 Ryanair’s destinations and network data. Source: Ryanair. The talks started last year. The big effort is in getting their booking systems to work together. The background to Ryanair’s growth is the low fares. 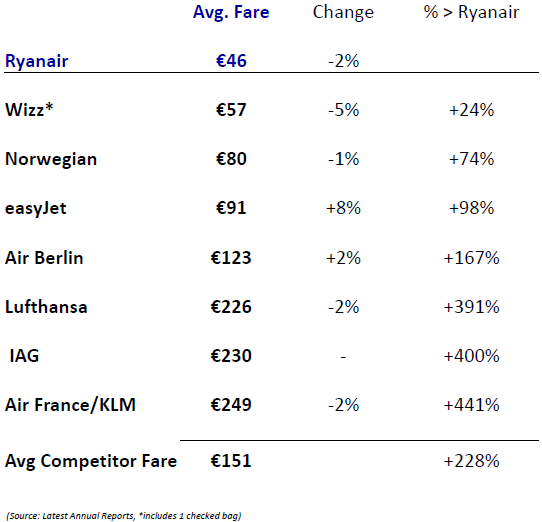 Figure 5 shows a comparison of the average fares of Ryanair and other low cost carriers. Figure 5. Average fairs for Ryanair and competitors. Source: Ryanair. To offer the lowest fares Ryanair has worked to keep its costs low from the start, Figure 6. Figure 6. Costs for Ryanair and its LCC competitors (AB1 is Air Berlin, LUV Southwest). Source: Ryanair. The costs are by passenger and not passenger miles, but as the LCC companies have similar networks (except for Norwegian, which has an emerging long-haul network), the numbers can be compared. Ryanair practices outsourcing to the extreme to get to this cost level. No pilots are Ryanair employees; they are all contract pilots. For most pilots, they are in their own companies. The same goes for many other employee groups. Another strategy is to fly to secondary airports to lower costs. This is different from the main competitors, easyJet and Norwegian, which fly to main airports. Ryanair’s start was mixed, with frequent losses until 1990. Then new CEO, Michael O’Leary, decided to change the carrier to an LCC. O’Leary had visited Southwest and got convinced the low cost, no-frills, model was right for Ryanair. Since then the growth rate has increased. After changing all ticket bookings to the Internet and introducing a one type fleet policy (Boeing 737 bought in large orders), the profits started to rise. Figure 6 shows the business figures for the last five years. Figure 6. Ryanair’s key numbers since 2010. Source: Wikipedia. 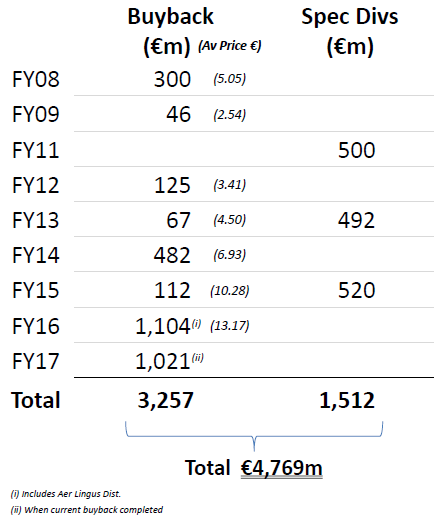 With profit margins after tax of over 10% of operating revenue, Ryanair has gradually grown a very strong balance sheet. Despite giving back substantial sums to its shareholders, Figure 7, the balance sheet is now one of the strongest in the business. Figure 7. 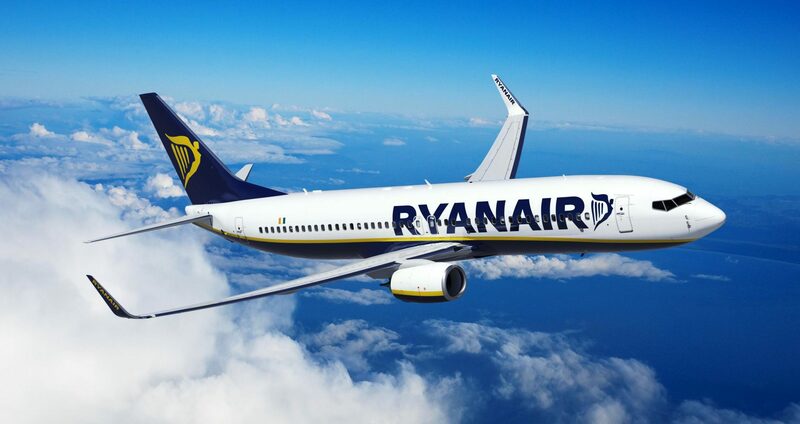 Share buyback and special dividends for Ryanair. Source: Ryanair. Shareholder’s equity is 45% of the sheets balance, Figure 8. Figure 8. 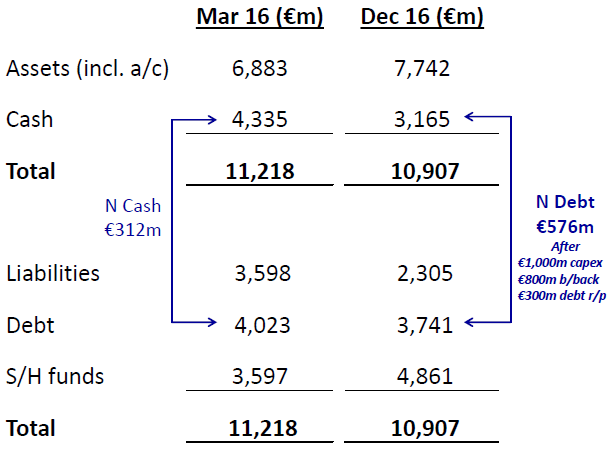 Ryanair year balance sheet at end Fy2015 and end 3Q2016. Source: Ryanair. I hadn’t flown with Ryanair for more than 10 years, when I flew it for a private trip from Frankfurt area in Germany to my native Stockholm. It was not an enjoyable trip. Service was poor and the crew unfriendly, more like herding cattle than serving passengers. Some time ago, Ryanair’s Chief Commercial Officer, David O’Brien, told me that Ryanair had changed a lot. The airline now valued their customers and had changed to a friendly attitude. It had also changed the Online website to go from 17 clicks, to three for booking a flight. And there was even business class offered. When flying out to the aircraft finance conferences in Dublin in January, I decided it was worth a try. Ryanair had the only direct flight, Nice-Dublin, on the afternoon before the conferences. Figure 9. Booking trip with Ryanair from Dublin to Nice. Source: Leeham Co. The website was good, one of the best I’ve tried. After some 10 clicks I was booked and had an account with Ryanair, Figure 9. The picture shows the page after defining your origin and destination. Note the “Check out” button at top right. No hassle with “shouldn’t you need this and that” before checking out unless one need a car or hotel. Flexible ticket. You are able to re-book, which you can’t with a low fare ticket. Fast track (when available). At Dublin but not at Nice airport. No big deal. Airport check-in. Necessary for business travelers with changing itinerary. Normal fare only offers online check-in. Priority boarding. The most important perk. With 189 passengers in a Boeing 737-800, you are glad to board first. 20kg check in bag and in addition the carry-on bag that most business travelers use today. As other passengers pay extra for this, most bags are picked at the stairs/gate and you have space in the overhead bins for your “business bag”. Reserved seat with recommendation on which are the good ones. No special seats but you can reserve your favorite spot. Boarding was OK, priority into the cabin is relaxing. Next, we pushed back 10 minutes early and this was an end-of-day flight. Not very common with mainline competitors. We landed 25 minutes early. Ryanair claims 90% of flights are on time. The seats are the same hard upright seats as I remember them from 10 years ago. But leg space is OK and now it was winter, so the leather seat and seat back were acceptable (I prefer fabric). No recline and no seat pocket. New aircraft in the fleet have the modern thin seats with more legroom, this was the legacy seats. I’m over 6 feet and the space with the legacy seats was acceptable. Would I do it again? Yes, if the schedule is the best and the flight is below three hours, I would book Ryanair. If they offer the best connection. The others cost are incredible in comparison, Southwest’s staff is unbelivable. Just a little note on staff: Ryanair does have a percentage of Pilots and Cabin Crew employed directly, not a big % but there’s a few direct contracts. Ryanair flies to most primary airports these days -alongside the secondary airports where original growth model was based – . Also, CEO has said that long haul expansion didn’t happen because Norwegian was quicker to secure the Dreamliners. They have not ruled out this business model. Am I correct that O’Leary wanted to/wants to go long haul, but Ryanair’s board just wouldn’t have any part of it? (They continue to have a “We have a good thing, why mess with it” attitude/philosphy?) Do you know if this is correct? Legroom acceptable, that says it all, on a short flight why would you pay more for less space and a bread roll a la legacy carriers. LCCs are often the most comfortable. Big part of net profit margin is very low corporate tax rate in Ireland. Compare pre and post taxation rates. Ireland is best by far EU domicile for a company. This takes nothing away from Ryanair, but helps explain its high stock market valuation. 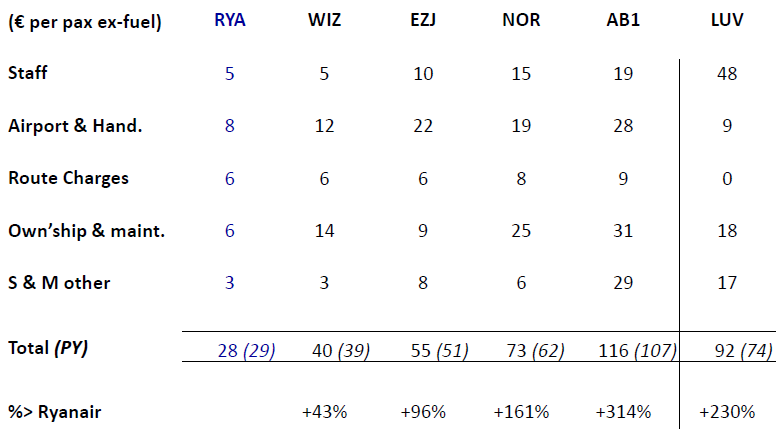 EZY : 91/55 = 1.65 –> the most profitable operator is EZY except if their fuel hedging is less attractive ?